There are certain hormones in your body that play a major role when it comes to controlling weight. One of them is called leptin. It is secreted by your fat cells and helps the brain regulate the amount you eat; acting as an ‘on-off switch' and telling you when you are full. The second hormone, insulin, is produced by the pancreas to manage blood sugar, or glucose. Insulin's job is to move the glucose around and get rid of it. After eating carbohydrates, which create high levels of glucose in our system, insulin is directed to the fat cells which turn off our fat-burning ability. To maintain a well balanced body, you attempt to get glucose into the muscles to be used as energy instead. Failing that, you try the liver, but if there's already too much glucose in the entire system, you have no option other than to store those carbohydrates as fats. If you’re generally fit and healthy, only a small proportion of your carbohydrate intake will be stored as fat. But you are still left with the second problem, namely insulin. This is of course a particular issue for those with Type II diabetes, who can produce insulin but are "resistant" to it, meaning even small amounts of glucose lead to a lot of the hormone in their system. What happens is that excessive amounts of insulin can block that other important hormone, leptin, so that the ‘I’m full’ message never gets transmitted to your brain. Put simply; if someone who is already overweight continues to eat carbohydrates, they simply cannot stop. If you have experienced this, it is not just a question of lack of willpower because your body’s entire physiology is working against you. Yet the unhelpful response from well-meaning doctors and many nutrition experts is “just eat less” (and exercise more), and the usually unspoken reaction from the general public when confronted by obese people is to turn their eyes and to associate them with laziness, slovenliness and a lack of personal discipline. Weight reduction clubs and programmes such as Weight-Watchers can help in a good way by bringing people together to talk about these things and share experiences; but weight loss is only likely to be permanent with a long-term dietary change; one which as yet is not part of today’s conventional wisdom. Weight-Watchers clubs as well as most branded slimming products promote the reduction of fat content in what you eat to lower your overall calorie intake. In doing so, they usually increase the proportion of carbohydrates you eat and in the end, they perpetuate the insulin cycle - leading to yo-yo dieting. Only a substantial reduction in your intake of carbs will allow you to begin a new cycle of personal success in your life, leading to weight-loss, better overall health, increased energy and improved self confidence. ​Diabetes UK advocates regular meals as opposed to snacking, but continues to advocate a diet rich in starchy carbohydrates and advises you to reduce fat consumption. So… although they have lots of good info on diabetic related topics, it is frankly difficult to take them seriously when it comes to dietary advice. Despite the short-term benefit there is a lack of evidence related to long-term safety and benefit of following this diet. I predict the time will soon come when they have to eat their words and lend their support to LCHF! There’s still an established thought pattern that to reduce weight, you just need to eat less. But ever since Gary Taubes bestseller 'Good Calories, Bad Calories' came out in 2008, the pendulum has been swinging in a different direction. Other articles on this site bring into question the role played by the nutrients in your diet, suggesting that more sugar and refined carbs have a heavier impact than healthy fats and protein. Now research on Type 2 diabetic patients, done by the Institute for Clinical and Experimental Medicine in Prague adds further evidence to the argument that a calorie is not always a calorie. When, and how many times a day you eat appear to have a significant impact on how you burn energy… at least among Type 2 diabetics. Researchers in Prague fed two groups of 27 people the same 1700 calorie diet, rich in fruit, vegetables and fibre and spread over two or six meals a day. Of their 54 volunteers, those who ate two meals a day lost more weight than those who ate six, and their blood sugar levels dropped (critical for diabetics). Half of the volunteers ate in the morning before 10 o’clock and then again at lunch, whereas the others grazed through the day having 6 smaller meals. Yet in spite of the quantity of food being the same, weight loss for those eating twice a day averaged 1.4kg more than those who ate often - and they also lost about 4cm more from their waistlines. Lead scientist Dr Hana Kahleova, said: "The patients were really afraid they would get hungry in the evening but feelings of hunger were lower as the patients ate until they were satisfied. But when they ate six times a day, the meals were not leaving them feeling satisfied. It was quite surprising." She said the study could well also apply to people without diabetes who were trying to lose weight. Dr Richard Elliott, research communications officer at Diabetes UK, commented that eating a healthy, balanced diet, being active and maintaining a healthy weight, alongside taking any medication was "vital" to effectively manage the condition. Same-old, same-old type of comment I'm afraid. Are diet foods & drinks confusing your metabolism? Low-fat diet foods make you put on weight because contrary to what the diet experts tell us, losing weight is not just about calories-in and calories-out. How can that be? Diet foods and drinks have fewer calories and in particular less fat, so they must make a positive contribution, mustn’t they? Let's take a look at some recent research. It involved 21 overweight and obese young adults and was conducted at Children's Hospital Boston and Brigham and Women's Hospital, Boston, Massachusetts, between June 16, 2006 and June 21, 2010. They ate either a low-fat diet (60% carbs, 20% fat, and 20% protein); a middling diet (40:40:20) or a very low-carbohydrate diet (10% carbs, 60% fat, and 30% protein) in random order, each for 4 weeks. During this time, they consumed the same total amount of calories, yet found that after using the low-fat diet, they burned 300 calories less per day! Their bodies had effectively become less efficient, recognizing that something was going on and so they went into a kind of reserve mode. Women who drank a small diet soda daily had a 33% increased risk of Type 2 diabetes; drinking a large soda led to twice that risk. 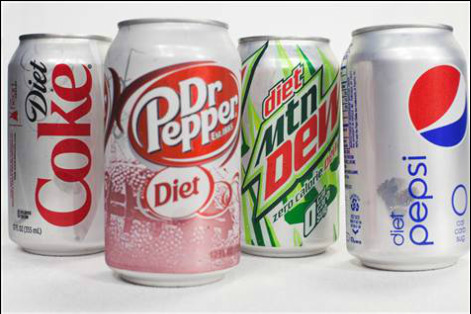 Women who drank diet drinks drank twice as much as those who drank sugar-sweetened sodas. By the way; they found that artificial sweeteners increased the chance of diabetes, fully independent of body weight! So diet drinks may really be even worse than regular sugar-sweetened sodas because they confuse your body. Artificial sweeteners which are hundreds of times sweeter than regular sugar, seem to trick your metabolism into thinking that sugar is on its way. This causes your body to pump out insulin, the fat storage hormone, leading to more belly fat… even though the text books still say otherwise. By confusing your body with artificial sweeteners, you slow down your metabolism. In other words, you burn fewer calories while eating low-fat ready-made foods and ‘diet’ drinks which is why, at the end of the day, they promote weight gain.